You can't find this place on any map. You can't buy a ticket at your travel agent to go there. But it exists, even today. It is an archipelago, a geographical term that means a chain of islands. It is a chain of islands across the face of Russia. It is the GULAG archipelago, as Solzhenitsyn described it in his book of the same name. Solzhenitsyn compared it to a sewer system down which were flushed millions of people. Who would want to go there? Who could survive such a place? Yet this man smiling in the above photograph did just that. To judge by outwards appearances, he seemed to be a bully, a street fighter, and most of the fights he picked on purpose, just for the devilment. His father once took him to the police station and begged them to put him into reform school. In eighth grade Walter made up his mind to be a priest. His father, of course, refused to believe it. But he fooled them all and entered the Polish minor seminary. Then Ciszek read the life of St. Stanislaus Kostka, another tough Pole who fought his family and at fourteen walked from Warsaw to Rome to join the Jesuits. Ciszek was three years from ordination. He hated the idea of "perfect obedience". But at age twenty-four without asking anyone's advice he presented himself to the provincial at 501 East Fordham Road in the Bronx and said, "I'm going to be a Jesuit. On September 7, 1928 he reported to the novitiate in Poughkeepsie, New York. Early in his first year he volunteered to go to Russia and, surprisingly, he was accepted. Only one condition, he had to finish the course of studies first.At the end of his second year of philosophy, however, he was informed that he was to sail to Rome to begin his theological studies at the Russian College. On June 24, 1937 he was ordained and said his first Mass in the Russian rite. The Russians took over the college, threw the books from the library into a dump truck, and left the Jesuits with nothing but the chapel. Then one day Ciszek went into the church to say Mass and found the tabernacle open, the altar cloths strewn about, and the Blessed Sacrament gone. It was the end of the Jesuit mission in Albertyn. The next four years he calls his years of education at "Lubianka University." Besides his previous routine, he did forty-five minutes of calisthenics every day, polished the floor twice a day, and sewed his clothes with needles he had made of fishbones from his soup. Since he had been convicted, the prison officials allowed him one book at a time and he read his way through Tolstoy, Dostoevsky, Turgenev, Gogol, Dickens, Shakespeare, and Goethe--all in Russian. There were interrogations at irregular intervals, threats, offers of "deals," but they became little more than irritating interruptions. It may be eighteen hundred miles as the crow flies from Moscow to Krasnoyarsk, halfway across the Russian subcontinent, but it was all part of the same archipelago. By train it is twenty-five hundred miles. By boxcar with thirty men in a car, it takes two weeks and a large can of deodorant. But Krasnoyarsk was not his destination Two days after he had arrived there, he was herded with two thousand other men onto barges in the Yenisei River for a twenty-day journey north to Norilsk. When they left Krasnoyarsk, it had been a sweltering hot day. When they arrived in Norilsk, it was stinging cold and snowing. They were now ten degrees north of the Arctic Circle. It was a motley collection of men: thieves, deserters, murderers, political prisoners--and one convicted Vatican spy. For twelve hours a day in the bitter cold Ciszek shoveled coal into freighters, still dressed in light cotton summer clothes with rags for shoes. Winter clothing was not issued until October when the temperature was thirty degrees below zero. In October, 1953 Ciszek was again sent to work in the mines. It was bitter cold and the work was brutalizing, but he was able to make thirty dollars a month which meant he could eat a little better. He worked in the mines for two more years--in this story "years" have the danger of looking like "days." But as his sentence drew agonizingly toward a close, his one fear was that he would have an accident in the mine within days of his release. Finally on April 22, 1955 with three years off for work quotas surpassed, his sentence was up. He walked out of the prison a free man. The scene was quite humorous. [He Leadeth Me, p. 168] He had survived fifteen years of hell. He had survived the GULAG but now he was cast adrift on the vast sea of Siberia. His freedom of movement was limited to the town of Norilsk, so for three years he worked there in a chemical factory. Most of the girls in the plant knew he was a priest and they covered for him if he came in late or had to leave early for a Mass or wedding or baptism. He even made several converts among them. After awhile he became so busy that he had to rotate the places for his three Sunday Masses. 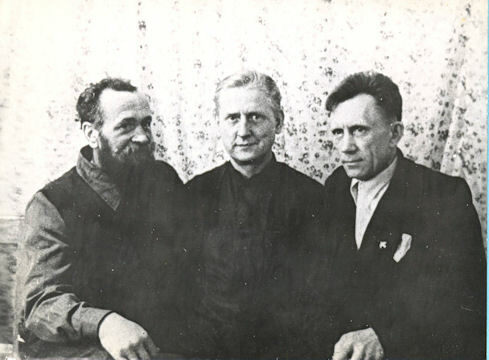 One of the first things Ciszek had done when he was released from the labor camp was to get permission from the secret police to write to his sisters in America. Suddenly a letter came. They were astonished that he was alive. For the first time since 1939, almost twenty years, someone in America knew that Walter Ciszek was still alive. By Easter of 1958 there were so many people in Norilsk for his midnight Mass that there was hardly room in the converted barracks for anyone else. Several men from the secret police, however, found space. The following Wednesday he was summoned by the KGB and given ten days to leave Norilsk "and never think of coming back." 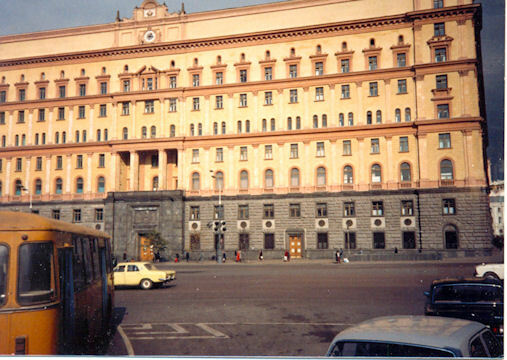 Ten days later a KGB jeep took him to the airport and put him on a plane to Krasnoyarsk. After twelve years he was leaving the Arctic. "By my second month at Krasnoyarsk, I had thriving mission parishes on the Pravi Biereg and in the outskirts and suburbs of the city. One German settlement out beyond the Yenisei station took over a whole barrack when I said Mass. More than eight hundred people attended, and there were baptisms and marriages before and after Mass sometimes for hours. I served another German community in a kolkhoz farther out and, since I still had my regular parish and the 'missions' on the Right Bank, I had to hold these suburban services on Saturday. . . . I worked sometimes around the clock, getting no sleep at all for more than seventy-two hours. "[With God in Russia] He was called into the KGB office, his passport was canceled, and he was given forty-eight hours to get out of town. He got a job as an auto mechanic in Abakan, one hundred miles south of Krasnoyarsk and remained there for four more years. Once again "'years" begin to sound like "weeks." In April of 1963 he received a letter from his sister Helen saying she had finally received a visa to visit Russia in June. The KGB which had denied it over and over again, miraculously gave Ciszek permission to meet his sister in Moscow, but only for twelve days. June came and went. There was a delay in his sister's visa. He waited. Then, abruptly, in early October he was summoned late at night by the KGB, told to quit his job, and be ready to leave for Moscow in three days. He left the meeting knowing nothing of where he was going or why. The prison camps again? Lubianka? Merely to meet his sisters? "'Good,' said Kirk, 'let's get it over with." The two of them shook hands, then Mr. Kirk turned to me. 'Father Ciszek, would you come over here?' I went over to the table as Mr. Kirk pulled a paper from his inside coat pocket. 'Would you sign this?' He handed me a pen and I signed; I was so badly confused I hadn't even the sense to notice what I was signing. "'Really?' I asked, momentarily stunned. 'It's all like a fairy tale,' I mumbled. Father Ciszek continued his priestly work in the John XXIII Center at Fordham University [which now is known as the Center For Eastern Christian Studies and is located at the University of Scranton in Scranton, Pennsylvania] by giving retreats, talks, counseling to many people who came to see him until his death on the feast of Our Lady, December 8, 1984. 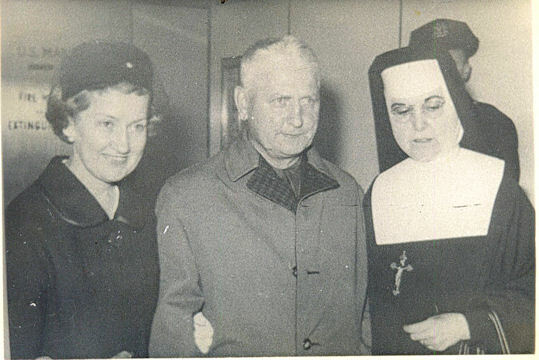 Almost immediately after his death, a petition to recognize his heroic virtues and outstanding holiness was circulated by Mother Marjia, the superior of the Byzantine Carmelite monastery Father Ciszek had helped to found. 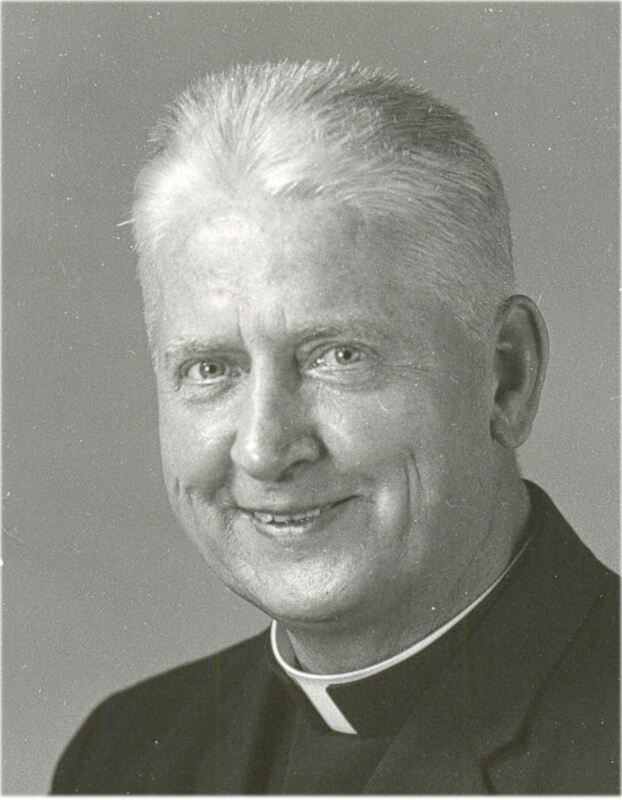 Five years later Bishop Michael J. Dudick began the official diocesan process of investigation for the Eparchy of Passaic and the Father Walter Ciszek Prayer League was formally incorporated as the Official Organization for the Promotion of the Cause of Canonization of Father Walter Ciszek. With the arrival of Bishop Andrew Pataki as the head of the eparchy of Passaic, the cause was transferred to the Roman Catholic Diocese of Allentown [in which see Shenandoah is located]. The Father Walter Ciszek Prayer League is now located at 231 North Jardin Street in Shenandoah, PA 17976-1642.